Bait and Switch, the title of a recent report released by Oceana, an organization which aims to protect the world's oceans, investigates the shocking problem of fish-sale fraud. The investigation primarily focuses on the misrepresentation and mislabeling of species -- selling cheaper, more readily available red snapper as salmon or farmed fish as wild-caught. In a "blind" visual identification test at the National Press Club earlier this week, two cuts of fish were laid side by side, unlabeled and skinless: red snapper vs. hake, halibut vs. fluke, fresh vs. farmed salmon -- and while a few observers were able to correctly identify the species, most of those polled admitted that they just "couldn't tell the difference". But the issue is not limited to markets, a percentage of the tested filets came from restaurants. 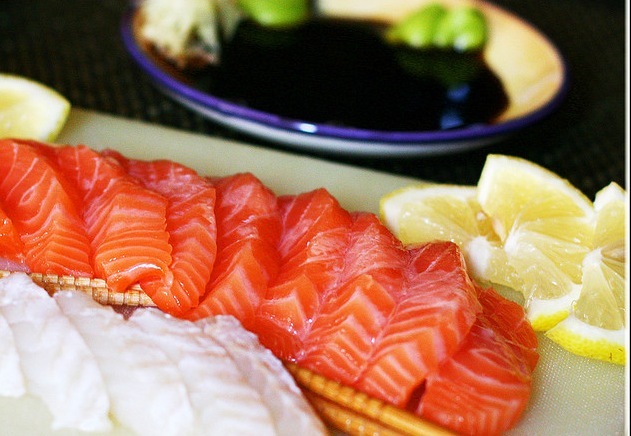 While seafood is one of the most popular foods in the United States, recent DNA tests of thousands of samples show that only 50% matched the label. Oceana has concluded that red snapper, for example, may be mislabeled 50%-77% of the time - a stunning statistic. So aside from the obvious issues of fraud, what's the big deal? "Species substitution is a way illegal fish can be laundered into the seafood market," said Michael Hirshfield, Oceana's chief scientist. "Species substitution not only undermines legal fishermen and legal fishing by allowing illegal fishing to flourish, it also undermines consumer-driven efforts to do the right thing and ask for species that are responsibly managed." Of the fish tested, more than a few samples turned up seafood from the endangered species list -- including shark meat -- obviously not something you would buy (or sell) if correctly labeled. Even more concerning is the health aspect: "[Say] you are allergic to fish, and you think you’re eating crab, and it turns out to be pollock...You could end up in anaphylactic shock.” How can this happen? Oceana looks to the Food & Drug Admin. (FDA). Under the Food Safety Modernization Act (FMSA), the FDA signed into law earlier this year, stipulates that high-risk foods should be tracked and traceable back to their geographic origin from harvester/hunter to processing and distribution centers. Sounds like a no brainer for seafood, right? Not yet. Oceana also feels that proper labeling of species absolutely falls under the Food Allergen Labeling and Consumer Protection Act of 2004 and should require strict, accurate labeling for the purpose of food allergy awareness.